I have 3 websites: aaa.my-domain.com, bbb.my-domain.com and ccc.my-domain.com all using a single wildcard certificate *.my-domain.com on IIS 7.5 Windows Server 2008R2 64-bit. That certificate expires in a month and I have a new wildcard certificate *.my-domain.com on my server ready. I want all those domains to use the new wildcard certificate without noticeable downtime. At least one other site is using the same HTTPS binding and the binding is configured with a different certificate. Are you sure that you want to reuse this HTTPS binding and reassign the other site or sites to use the new certificate? The certificate associated with this binding is also assigned to another site's binding. Editing this binding will cause the HTTPS binding of the other site to be unusable. Do you still want to continue? This message tells me that https://bbb.my-domain.com and https://ccc.my-domain.com will become unusable. And I will have downtime for those at least until I'm done replacing the certificate for those 2 domains too, right? I was thinking that there must be a smarter way of doing this. Possibly through the command line that replaces the wildcard certificate with a new one for all website at once. I couldn't find any resources online as to how to do that. Any ideas? So, what we want to do is do certificate re-binding on the OS layer. The OS layer takes control of the SSL part, so you use netsh to associate a certificate with a particular socket. This is done through netsh using netsh http add sslcert. When we bind a (new) certificate to a socket (ip + port), all sites using that socket will use the new certificate. This part explains how to proceed step-by-step. It assumes you have some websites (aaa.my-domain.com, bbb.my-domain.com) running a *.my-domain.com certificate that is about to expire. 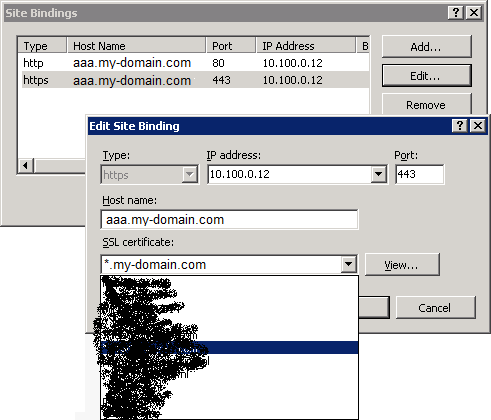 You already have a new certificate that you already installed on the server but not yet applied to the websites on IIS. First, we need to find out 2 things. The certhash of your new certificate and the appid. certhash Specifies the SHA hash of the certificate. This hash is 20 bytes long and specified as a hexadecimal string. appid Specifies the GUID to identify the owning application, which is IIS itself. certutil -store My | findstr /R "sha1 my-domain.com ===="
1234567890123456789012345678901234567890 is the certhash we were looking for. it's the Cert Hash(sha1) without the spaces. Open a command prompt and run it as a administrator. If you don't run it as administrator, you'll get an error like: "The requested operation requires elevation (Run as administrator)." DONE. You just replaced the certificate of all websites that are binded to this IP + port (socket). Not the answer you're looking for? Browse other questions tagged windows-server-2008-r2 ssl command-line-interface iis-7.5 ssl-certificate or ask your own question. Setup IIS 7.5 with multiple website bindings and SSL? Can I have two IIS sites using one SSL certificate where one is a “sub folder”? IIS 7.5 - can't configure two SSL Certificates under one IP-adress?